Mugabe is the 93-year-old president of Zimbabwe and has served as president or prime minister since 1980 (when an independent, majority-rule Zimbabwe came into existence)—meaning that he has been in charge for the entire lives of approximately 85 percent of the population. He is also personally under sanctions from both the United States and the European Union for undermining democratic institutions in the country and directing his supporters to violently attack members of opposition political parties. He has presided over the collapse of the Zimbabwean economy and has seen the country go from being a major agricultural exporter to relying on imports. He described the British government under Tony Blair as being run by “gay gangsters” and said the UK could “go to Hell.” His government is currently being investigated for violating UN resolutions against trading with North Korea. Zimbabwe’s health system is frequently described as being “in crisis,” even as the economy has slowly rebounded in recent years. Mugabe’s own health has been the subject of widespread speculation, and his frequent trips abroad for medical care have raised serious questions. When you have to re-enact scenes from Monty Python to reassert your own health, you’re probably not in a great situation. In the speech where he announced Mugabe’s appointment, WHO Director-General Tedros Adhanom Ghebreyesus praised the nonagenarian leader for his commitment to universal health care and emphasized that Mugabe would able to nudge his fellow leaders to place a greater emphasis on noncommunicable diseases. Mugabe’s new appointment (which, it should be noted, is a two-year unpaid gig) was praised by the country’s foreign minister as a “major health diplomacy coup for Zimbabwe.” Twitter, as you might imagine, was less thrilled. Even I got a bit snarky about it (I’m sure that’s a major surprise). Snark is all fine and good (and the energy on which Twitter runs), but Mugabe’s appointment is as absurd as it initially seems for two reasons. First, noncommunicable diseases (NCDs) are responsible for an increasing portion of deaths in sub-Saharan Africa. In 2015, the Population Reference Bureau estimated that NCDs would be the region’s leading cause of death by 2030. The drivers of this increase are the same as in other parts of the world: tobacco use, diet, alcohol abuse, and physical inactivity. There is greater recognition within global health systems that NCDs need to be on the agenda and deserve greater attention. Indeed, the meeting where Tedros announced Mugabe’s appointment was part of WHO’s Global Conference on Noncommunicable Diseases, and reducing premature death due to NCDs is one of the Sustainable Development Goals. Far from being diseases of affluence, NCDs now represent a serious challenge in every region of the world—including sub-Saharan Africa. Second, and this may be hard for folks to comprehend, Mugabe is a popular guy. It is undeniable that a significant chunk of the Zimbabwean population supports him. That doesn’t mean that he’s won all of his elections fair and square, but polling by Afrobarometer in 2015 found that he was trusted by 70 percent of rural voters and 45 percent of urban voters—rates far higher than any of the opposition political figures. At his birthday party in 2016, some attendees likened Mugabe to Jesus Christ. There’s even an R.G. Mugabe clothing line. That popularity also extends to the international realm. In 2015, Mugabe was appointed chairman of the African Union. This is largely a ceremonial post, but it demonstrates the level of respect that he commands among some quarters. Both Thabo Mbeki and Jacob Zuma of South Africa have lent Mugabe diplomatic support. While not universally beloved by African leaders today, Mugabe continues to command a great deal of respect because of his iconic status as someone who led his country to independence. He is one of the last of the freedom fighters, and that affords him a degree of influence that is surprising to people who think of him only as a figure of economic mismanagement and reckless policy. If you are looking for a leader who can have influence in the region, Mugabe actually makes some degree of sense. Indeed, at a WHO-sponsored conference in Victoria Falls earlier this year, Mugabe implored the attendees to develop innovative financing structures to expand health access. 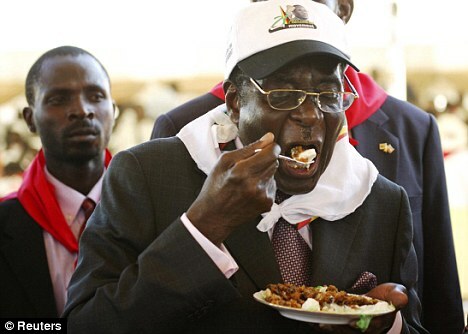 That said…we’re still talking about Mugabe. He may have his domestic and international supporters, but he also inspires intense opposition. Goodwill ambassadors generally aren’t under international sanctions. Mugabe may call for innovative health financing, but this is the same guy who oversaw the collapse of his country’s health system due to economic mismanagement. How can someone widely condemned for abusing his citizens’ human rights effectively support the fulfilment of the right to health? Goodwill ambassadors aren’t all going to be like Princess Diana, but they should probably avoid threatening to behead gay people. Tedros’ decision to make Mugabe a WHO goodwill ambassador has some logic behind it, but his efficacy is going to be overshadowed by the utter antipathy he inspires. That’s going to make the push to include NCDs in the health agenda in developing states that much harder to do. The Politics of Grief and the Forever War: Who Speaks for the Fallen?